A friend of mine who is about to take a trip spent half a day looking at portable chargers. “Nora!” he said. “There’s so much stuff out there! I don’t even know where to begin! I got stuck on chargers alone!” Tell me about it. You’re not alone. Here is your guide to all the electronic travel gear you might want to consider for your next trip, with recommendations from the travel industry’s most experienced voyageurs. 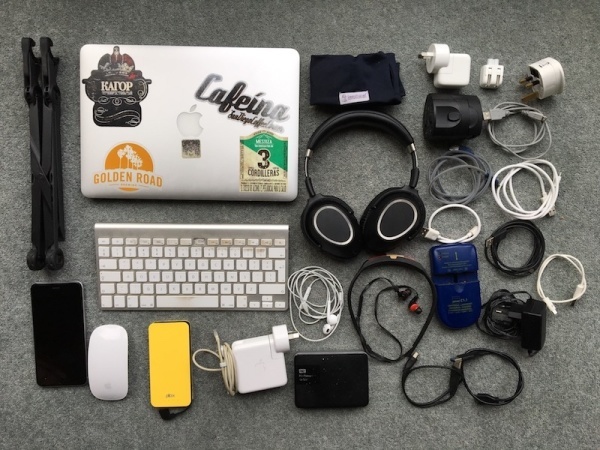 I learned through trial and error what the best electronic travel gear is for my travel style and needs. And depending on the gear in question, trial and error is a pretty crappy (and expensive) way to learn. But there’s no one-size-fits-all solution to electronic travel gear. Much of it depends on what you want to do on the road. 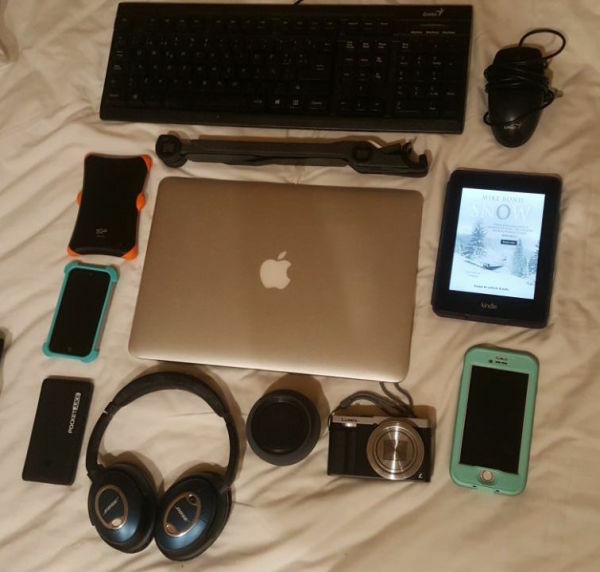 So I asked some of the industry’s most experienced travellers to show us what electronic travel gear they travel with and why (one of whom travels without a phone!!!). Between all of us, hopefully you’ll find exactly what you need to make your trip a breeze. I’ve been travelling the world full-time since 2007. 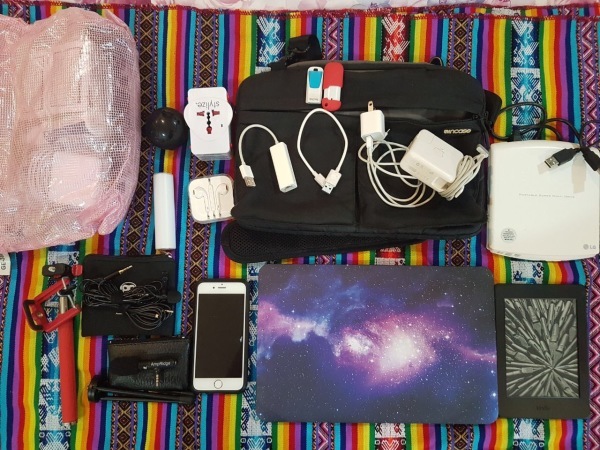 I started off with way too much stuff (electronic travel gear included), and slowly streamlined to the point where I travelled for a couple of years with carry-on luggage only. (See also: How to Travel Ultralight With Carry-On Luggage). This included streamlining my electronic travel gear as well. For example, I used to own (and love) a Canon G9 Camera which I used for pictures and video. But it was a pain to carry around, and routinely the “Kodak moments” happened when I only had my smartphone. So, I ditched the Canon and the phone and got a smartphone with an excellent camera (at the time it was a Nokia Lumia 1020 with a 41mp camera). I’ve since returned to iPhone now that the on-board cameras are better. It remains my only camera. Macbook Air 11” (souped up) – I always buy the best computer I can afford at the time of purchase. I like the Macbook Air (with upgraded guts) because it’s small, light, has solid state storage (which is faster and more rugged for travel’s hard knocks), and Apple is very user-friendly. iPhone 6S (unlocked) – It’s very important to get an unlocked phone, so that you can insert local SIM cards as you travel. Wireless Earbuds (not pictured) – In addition to the earphones that came with my phone, I have some wireless earbuds which are handy especially for walking. Kindle Paperwhite – Physical books are completely impractical. I’ve had a few e-readers along the way, and I like the Paperwhite the best; it has a killer battery life and is easy on the eyes. Boom Microphone (Ampridge MightyMic Shotgun Video Microphone) – Whenever I record video for my vlog on the fly, I just plug in my little boom mic for drastically improved sound quality. Lav Microphone (PowerDeWise, with extension cord) – For even better sound quality yet, this lavalier mic is a winner for staged video shots. Selfie Stick with Tripod attachment – Loathsome as selfie sticks are, they’re admittedly very useful for vlogs. Mine also turns into a tripod, which is very handy. USB CD/DVD drive – This is tops on my list of things to get rid of. It’s so rare that I need a CD/DVD drive (which my computer lacks), and although it’s occasionally useful, I think I can find workarounds. External Portable Hard Drive (Silicon Power) (not pictured) – As queen of backing things up multiple ways, this rugged hard drive is essential. I always store/travel with it separately from my computer. If one goes missing, I have the other. Mini Speaker – Onboard speakers are notoriously crappy. This little guy is an improvement for movies/music. Small Power Pack – Small and very useful for charging stuff on the go. Universal Adapter – A travel essential. I’ve been through a few different ones on the road; I tend to get whatever’s available wherever I am – they’re sold just about everywhere. USB Sticks – Great for sharing files with others, and of course, as an extra layer of backup/security with my USB Stick Trick. inCase Laptop Bag (briefcase style for extra protection and cord storage) – I’ve had this exact model for 10 years and it’s still going strong. Great protection for my laptop, and so much better than a sleeve because it has pockets for storing various adapters making it an all-in-one-solution. Laurence is a full time travel blogger and photographer who has been travelling the world, taking pictures of it and sharing his stories on his blog since 2009. His wife and he work together, and they run two sites: Finding the Universe and Independent Travel Cats. 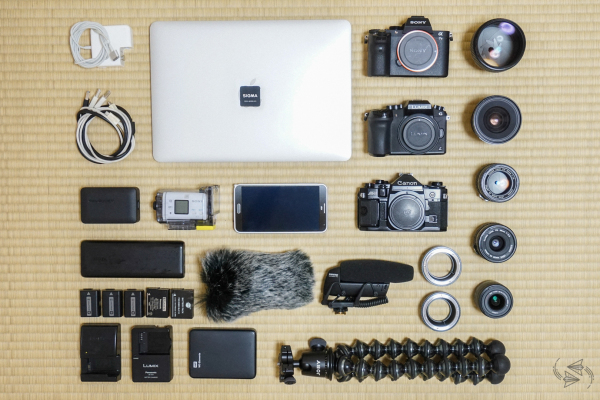 As a travel photographer, I end up needing a lot of photography equipment as you can see from the picture above. 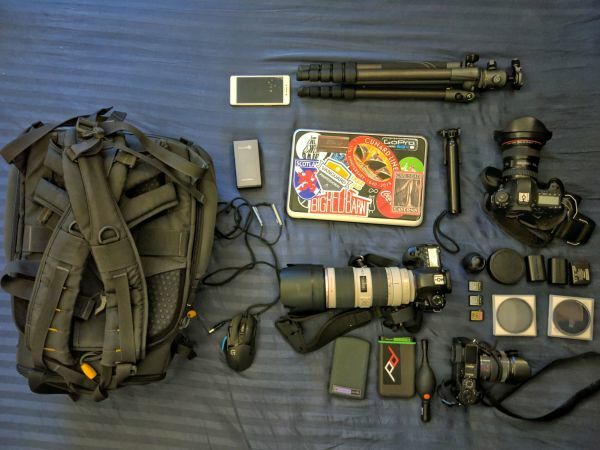 I try to travel as light as is practically possible given all the gear requirements we have, with just the bare minimum in terms of camera bodies, lenses and accessories. So that means we have a camera with a wide angle lens for landscape, a long lens for portrait / animal shots, and a backup mirrorless camera for when we want to be a little more inconspicuous. We also have a variety of “can’t live without” photography accessories that always travel with us. These include a carbon fibre travel tripod (light and stable! 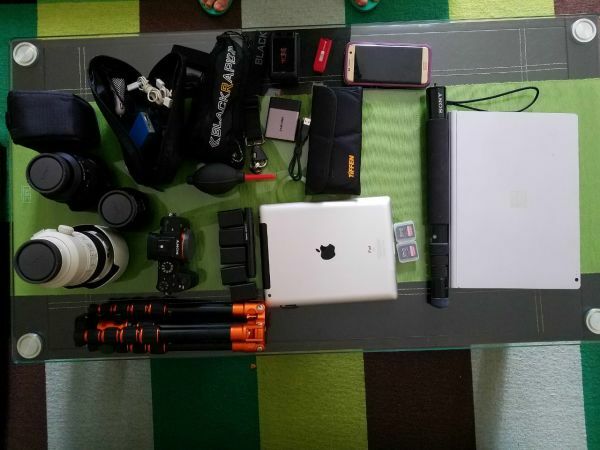 ), various filters, spare batteries, a cleaning kit and memory cards, as well as a selfie stick. We’ve also been experimenting a bit with 360 photos, hence the 360 camera. Finally, taking the pictures is only half the battle, so I’ve also got a laptop, two external hard drives for backup purposes, and a gaming mouse, which makes Lightroom editing so much easier as it has loads of buttons for shortcuts. We have more lenses, an external flash and countless cables too of course, but we rotate them based on need – what you see in the photo is what we always take with us everywhere we go! Craig and Linda Martin are New Zealanders who have been travelling full time since 2006. They’ve spent extensive time in Europe, South America, and Oceania, and are always looking forward to the next adventure. They run Indie Travel Podcast and Performance Foundry. Since we work while we’re travelling, we need a full office set up. This means laptops, external mouses and keyboards, and Roost stands to raise the laptops to a suitable height — working on a laptop by itself is really bad for your body! We also have a phone each and Linda carries a Kindle; Craig loves to listen to audiobooks and podcasts so has a LOT of headphones. Since we record our podcast while we’re travelling, we also have a Zoom H2 recorder. Various adapters help us stay charged wherever we are in the world, and a battery charger keeps our reusable batteries powered up. Louise was a digital nomad before that was even a thing. She left the USA in 2008 to live abroad and has spent most of the last nine years living in seven countries and travelling across 50+. She runs her Pinterest marketing consultancy from her laptop and usually spends winters in Thailand, where she is now. Learn more about out her online business at Pin Coach. I joke that although my suitcase appears quite big, it contains everything I ‘own’ (OK, I have small storage box but I live on the road all year long with just the one large suitcase) and I also have a mobile yoga studio and home office in there! SP Armor External hard drive – The external hard drive is for backing everything up to a clone disk. I also pay for cloud backup with Backblaze, and I have another external at my mom’s place in California that is for a Time Machine style backup (which has failed me in the past, hence the multiple backup methods!). In case my computer dies on the road and I need another, perhaps a borrowed or temporary laptop, the clone disk on my external hard drive will allow me to keep working and save my changes in the interim until I can replace the computer. iHome iBT62 Bluetooth Speaker – The speakers are for watching shows and movies and listening to music from the computer. The built-in speakers are awful and this one has really come in handy. iPod 4 – The iPod is a vestige; I don’t think they make it anymore but I use it to keep many gigs of tunes from my iTunes somewhere that I can listen to if I’m in the mood for music, without needing an internet connection or draining the battery on my iPhone (I have a few tunes on there but mostly use that one for podcasts and audio books). BOSE headphones – My noise cancelling headphones are due for a replacement – I bought them used on eBay and they are so old that they still use AAA batteries! – not sustainable. But they do the job on noisy planes and when I need to cut myself off from the world for a while. The quality is also higher than anything else I have. Maxrock Headphones – Those little pink headphones you see in the case tucked under my iPhone earbuds are not as good but if I want to fall asleep to a meditation audio, they fit in my ears perfectly and I can lay on my side with them in, unlike with the BOSE or iPhone earbuds. Panasonic LUMIX DMC-ZS50S camera – My camera is for visiting new places so I can get high-quality photos. I use the iPhone for everything else but despite having an iPhone7 model, I still find the photo quality to be subpar, especially if you want to zoom in on ANYTHING. I prefer having a camera for when I’m out sightseeing in a new destination. Lifeproof watertight case – My iPhone 7 is for everything under the sun – including a bit of snorkeling with my Lifeproof watertight case. Kindle Paperwhite – My kindle is for reading ebooks and PDFs, obviously. Pocket Juice power pack – And the power pack is for long bus rides when I’m using the battery up for Audible books, podcasts and surfing (on the off chance that I have a local SIM card for internet but no wall plug available on the bus or train). Jessica & Hai are travel and life addicts who have ventured to more than 50 countries over the past decade. They are currently based in Tokyo, Japan and document their adventures on their blog, Notes of Nomads. 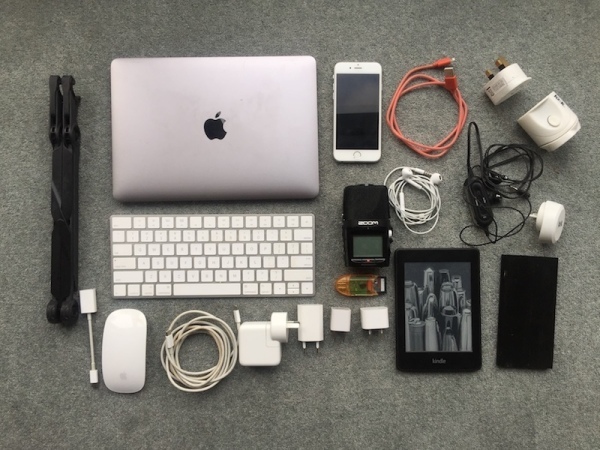 We always bring at least one camera each, a mobile phone for Google maps and staying connected, and a power bank on our travels. A power bank is essentially a large battery that we can draw power from anywhere, anytime, via USB. It’s saved us more than a few times when our phone or camera batteries have died on big sightseeing days or when we don’t have access to power outlets, like when we’re camping. Apple MacBook Air – Thin, light and sufficiently powerful to handle blogging on the go. RavPower 4 USB Travel Wall Charger – Rapidly charges 4 USB devices simultaneously. w/ SPK-AS1 Dive Case – For water sports or heavy rain. Samsung Galaxy Note 3 – Google maps and live sharing. Anker PowerCore 20100 – Charging USB devices when we don’t have access to an outlet. Camping and power intensive trips etc. Additional electronic gear depends on the nature of our travels – where we’ll be going, the types of activities we’ll be doing and the duration of our trip. We often go without a laptop and external hard drive on short trips when we are mostly posting social updates from our phones, but definitely need it for blogging and video editing, as well as data storage, on longer trips. The combination of cameras and lenses, and whether we bring a tripod, is a fine balance between weight and the types of shots we plan on taking. As we get more and more into video, our external mic and deadcat (that big fluffy thing that goes over the mic) will no doubt be one of our staple choices in the future as it’s light and doesn’t take up much space. w/ Neweer MIC-121 DeadCat – Clearer and focused audio, especially in windy conditions, noisy crowds. Western Digital Elements 2TB – Physical backup when on extended travels. Sony A7II – Compact digital full frame camera with an image stabilized sensor. Perfect for use with manual lenses. Panasonic Lumix G7 – Ergonomic and super light with a fully articulated touch sensitive screen. Perfect for capturing 4K video. Canon A-1 – Reliable and easy to use. For capturing a beautiful film aesthetic. K&F Concept FD -E & MFT -E Mount adapter – Allows legacy lenses to be used with our digital cameras. Canon FD 50mm f/1.4 – Compact standard lens. Great in most situations. Canon FD 35mm f/2.8 – Light and small lens, perfect for street photography. Canon FD 17mm f/4.0 – Ultrawide rectilinear used for tight indoor shots, landscapes and astro photography. Panasonic G Vario 14-42mm f/3.5-5.6 II – Small, light and sharp standard zoom for video. Joby GorillaPod Focus + Ballhead X – Compact, sturdy and versatile. Gigi Griffis is a world-travelling entrepreneur and writer with a special love for inspiring stories, new places, and living in the moment. In May 2012, she sold her stuff and took to the road with a growing business and a pint-sized pooch. She’s also the author of 11 guidebooks, the architect behind the DIY Website Workshop (use discount PROHOBO for $49 off! ), and a blogger at gigigriffis.com. Yep. I gave up the phone a few months into travelling full-time. I realized I hate being on the phone, I didn’t want to pay for an international plan for something that gave me no joy (and that I could do on Skype and Google Voice for like $50 a year), and I loved the freedom of not being constantly connected. When I’m at my computer, I’m at work. When I’m out exploring, I’m fully present in that moment. Very occasionally it is annoying, but the world is super connected now, so it’s really not that hard to find Wi-Fi or a kind-hearted stranger with a phone you can borrow in an urgent situation. MacBook Pro laptop – For work, the most important thing for me is my laptop, so that’s the centrepiece of all my other gear. It’s how I make calls (I don’t have a phone), do my work, watch movies, store music, and stay in touch with friends around the world. It’s my lifeline and the second thing I’d rescue in a fire (after my dog). Tablet – For reading (and situations where I urgently need Wi-Fi to get in touch with someone or get directions while I’m out and about, since I don’t have a phone). It’s a Kindle Fire, but I hate it with a passion and wouldn’t recommend it (the tech is sub-par, it takes forever to charge, and despite buying the no-ads version, Kindle is constantly putting ads up on my main screen). I’ll be replacing it over the holidays with an Android or iPad – haven’t yet fully committed to a model. Sony a6000 mirrorless camera (not pictured) – My camera I use for both work (cover photos for books, photos I sell with my travel stories from time to time, and blog photos, among other things) and my own pleasure. I chose the Sony a6000 for its lightness and great photo quality. iPod – My iPod is for both pleasure and research (podcasts have gotten so amazing these days, they often provide really great research resources). Cord and plugs for European and most North and South American outlets – The plugs are for the two continents I spent the most time on (Europe and the Americas). Small USB stick – For times when I need to run to a print shop or hotel front desk and print out a contract or a train ticket (this comes in handy often). Sticky notes – Despite working extensively with tech, at a soul level I’m something of a troglodyte. I love notebooks and paper and arranging ideas in a physical space. Which is why I always have at least one notebook, multi-colored pens, and sticky notes (which end up stuck all over windows and walls when I’m mapping out new ideas or content strategies), in addition to my more technical gear. Dan and Linda Bibb have been to over 50 countries and lived on four continents. Currently living in Malaysia, they share their travel photos, tips and advice on As We Saw It. When it comes to electronics, we try to bring the bare minimum. Everything valuable comes with us on board, and electronics can get heavy! Nothing irreplaceable gets checked, because things have been known to go missing from people’s luggage in transit. (You never know when some baggage handler might have sticky fingers!). We also both use the same gear, across the board, as backup. 2 Microsoft SurfaceBook Pro i7 with cords – We prefer PCs and so chose our SurfaceBook Pro for its light weight, power and size. 2 Samsung 2tb SSD drive – We use large SSD drives because Dan shoots 42MP images and he shoots a lot of photos for our website! 2 Apple iPad with USB cord – iPads are for down time – they’re ideal when we want to relax with a game of Solitaire or an interesting Kindle book (there’s a free app for that). 2 Samsung Galaxy S7 edge – Our phones help us to stay in touch with everyone and share our journey on social media. 2 Tumi world power adapters with 4 USB ports – We chose the Tumi power adapters after a lot of trial and error. Those four USB ports come in handy! Ken started travelling in early 2017, and has been to 10 countries so far this year. He started in the US, then to Asia, back to the US for a bit, and now in Europe until the end of the year. As an answer to his inability to find comprehensive information about becoming location independent, Ken created the Work Anywhere Summit. 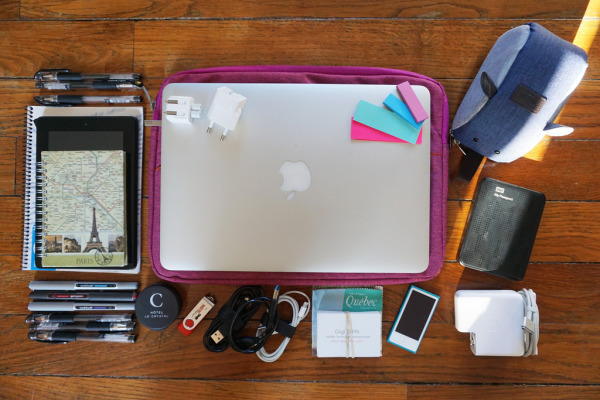 It’s no surprise that every digital nomad has a laptop and a smart phone. They’re the bare minimum, right? (Surprisingly, no, not according to Gigi!) Since I’m also a photographer and am starting to dabble in videography, I carry a couple of cameras on me. The professional looking one for when I have specific shots I need to take. The point & shoot when I’m simply out exploring and don’t want to carry the Canon on me. 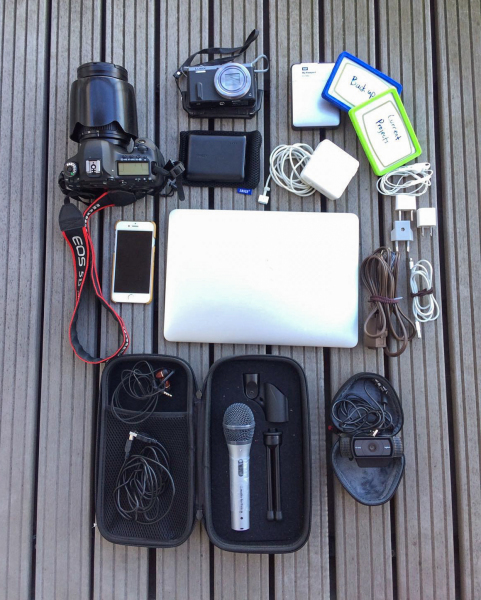 The microphone and laptop HD camera are used for when I record interviews with Work Anywhere Summit speakers. Don't subscribe All Replies to my comments Notify me of followup comments via e-mail. You can also <a href='https://www.creditwalk.ca/comment-subscriptions/?srp=5113&srk=2648578ecea05c83754707575dc5a494&sra=s&srsrc=f'>subscribe</a> without commenting.